If you close this form or exit the browser, you will lose any information already input. Villages Honor Flight, Inc. recognizes American veterans for their sacrifices and achievements by taking them to Washington, D.C. to see THEIR memorial at no cost. Top priority is given to WWII and terminally ill veterans from all wars. Volunteer Guardians will go along providing assistance and helping veterans have a safe, memorable and rewarding experience. 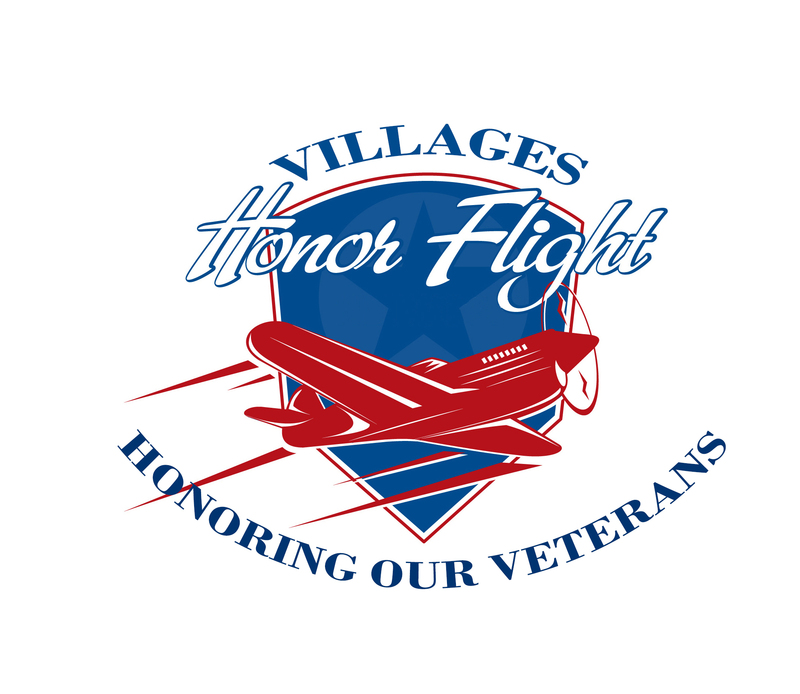 For what you and your comrades have given to us, please consider this a small token of appreciation from Villages Honor Flight, Inc. The name and date of birth provided on this application must match the photo ID you will use on Flight Day. Information provided will not disqualify you. It permits us to assess the support we need during the trip. Inormation is for Villages Honor Flight Medical Personnel only. *DISCLAIMER: Wheelchairs with 250 lb. maximum weight limit are provided for each Veteran and may be required during certain portions of the HF trip. EXAMPLE SHOWN with name of medication and how often taken. PLACE EACH MEDICATION ON A NEW LINE. If yes, list drugs and type of allergic reaction. If you have had any type of seizure within past 5 years, it is STRONGLY advised that you discuss trip with your private physician. Do you have motion sickness (sea or air)? If motion sickness is not controlled by medications, you are STRONGLY encouraged to discuss the trip with your private physician. Describe type of breathing problems. If you use a home nebulizer machine you are STRONGLY encouraged to discuss the trip with your private physician concerning the use of portable hand-held nebulizers during the trip. If you use oxygen you will need YOUR PRIVATE PHYSICIAN TO WRITE A PRESCRIPTION for oxygen to be used during the flight and during the tour. Oxygen will NOT be provided. The prescription should be turned in with the application. Oxygen will NOT be provided. Vets are required to provide their own POC's (personal oxygen concentrators). Liquid oxygen is NOT allowed on the airplane. The prescription should be turned in at the Preflight meeting. How many blocks can you walk before getting tired? Can you climb 6 steps on to a bus and walk down its aisle? Have you ever been told, or do you believe, you have PTSD? Do you have a defibrillator? Check the box if you have a history of any of the following. Do you still have head, ear, or sinus problems? If you have NEVER flown since the open head injury, sinus or ear problems, we STRONGLY encourage you to discuss the trip with your private pysician. Do you have a uostomy or colostomy bag? If yes, please make sure the bag is vented prior to flight. If you do not know if your bag is vented, it is STRONGLY advised that you discuss this issue with your private physician. PLEASE REVIEW CAREFULLY AND SIGN. I hereby give permission for my images to be taken or captured during Villages Honor Flight, Inc. trip through video, photo, or other media, to be used solely for the purposes fo Villages Honor Flight, Inc. promotional material and publications, and waive any rights or compensation or ownership thereto. I understand that medical insurance is the responsibility of the veteran and that Villages Honor Flight, Inc. does NOT provide medical care. I understand that I accept all risks associated with travel and other Villages Honor Flight, Inc. activities and will not hold Villages Honor Flight, Inc., any staff, volunteers, or other Villages Honor Flight representatives responsible for any injuries incurred by me while participating in the Villages Honor Flight Inc. program. Typing your name below constitutes your digital signature when sending via email.